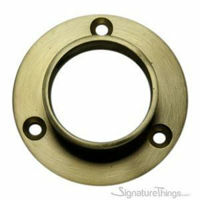 SignatureThings.com is one of the few stores where you can buy Tubing made off Brass in Multiple Diameters, Multiple Wall Thickness, and in Multiple Finishes. We stock tubings in 3 wall thickness: 0.040, 0.062, and 0.125, We can also get tubings in 0.050 and other wall thicknesses, just email us requirements at contact@signaturethings.com or call 480-463-1912. Link to FAQ about use for Closet Rods, modern curtain rods, acrylic curtain rods. We stock tubings in 6 feet and 12 feet in length and can cut them to your specific size requirements before shipping. We can ship is 7 '-9" via any shipping provider. We can ship 10 feet pieces for additional costs via USPS. We can also arrange Longer Tubing shipments up to 12 feet via YRC Roadway but will require additional shipping charges based on the Zip Code, call 480-463-1912 if you need longer tubing. We also have matching End and Center brackets, Closed and Open End Flanges, Two Piece Flanges, End Caps, etc. Our hardware is guaranteed to work with each other, e.g. 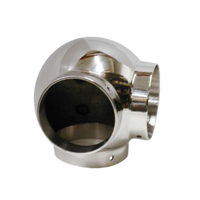 If you buy 1 1/4' D tubing and 1 1/4" D Bracket and 1 1/4" D Flanges they are guaranteed to work together. So just pick the same matching diameter for all the products.